This is Part 1. To skip ahead, check out to how I categorize the results of these 2 queries. So, you have a WordPress site where you’re using custom fields on a custom post type. Great! When you display your custom post type, you can use a get_post_meta( $post_id, 'my_field_name' ) call to show your new field, echo it out and your’e done! Easy-peasy. That’s great if you want the meta data for one item, but what if you want the custom field for multiple items? What if you want to get that custom field for ALL the items? Spoiler alert: There is no magical function in WordPress that you can pass a key to and have it spit out all the data in a nice tidy array. Booo! So, recently I was faced with a problem that I initially thought would be really easy, but it turned out to be more complicated than I thought. I needed to get the data for several custom fields for every single product post type. Sounds easy, right? There must be some magical function in WordPress that you can just pass the key of a custom field and have it spit out all the data in a nice tidy array, right? The data is not the problem. These fields are essentially links to downloadable assets (PDFs usually) related to the product that physicians may want to read. The product_profile field would point to a uri where the file is located and the _description field is essentially an excerpt from the document so you know what you’re downloading. My instinct told me that there should be some WordPress method like get_posts_metas which gets all the metas that I want. In my imaginary idealistic world, you would call it like this get_posts_metas( ['product_profile', 'product_profile_description'], 'product' ) and this unicorn function would magically return all the data that I need. Note: There is no unicorn function called get_posts_metas that returns all the data that I need… but there should be. Although this will work, this method will NOT scale well. If you have only a few items, it will work in a pinch, but let’s look at what we’re actually doing. If you had 100 products that you needed to get meta data for… you are calling the database 101 times ( once when you call get_posts, and then once each time you call get_post_meta ). If you had 1000 products… 1001 calls! Sure, you could cache it, but it’s still wasteful and it won’t scale well, especially when you consider that meta_data is stored in just ONE table! You should be able to do this in only ONE call to the database. So how do we do it? Like many things, the scalable way is harder. But it’s worth it, trust me! Stick around, and we’ll get through it step by step. It will involve some SQL, but I won’t get into database theory (well not too much, anyhow). Although it’s more difficult, it’s only a little bit more difficult and understanding how WordPress structures its data never hurts and will make you a better developer. The post_meta table is ONE table. I won’t get into how the SQL works here, but you should be able to modify that code to work on your data. Your tables may start with a different prefix than wp_ and you’ll have to use your meta_key field names. So how do we do get this data into WordPress? So, we have an idea of the SQL that we want to run in the database, but before we do that, we need to know about the prepare method that is part of the $wpdb class. This method allows you to prepare RAW SQL for consumption. 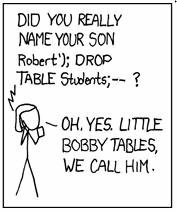 Safe is good when you’re using SQL into your database, and essential if you’re ever relying on user input. The documentation for prepare is pretty straight forward, so I’ll leave you to read it. The second function you’ll want to know is the get_col method. Documentation for get_col is also straigtforward. Give it SQL, it gives you results for a column. There’s a few new things in that SQL. First, we use the DISTINCT keyword. That just makes sure we don’t get duplicate rows. $wpdb->postmeta returns the name of the WordPress postmeta table. You can’t guarantee it will be wp_postmeta because WordPress allows you to choose the database prefix. Multisite also changes up the table names. The LIKE keyword is a wild card Keyword and it relies on % to do it. In WordPress you need to escape it by using %% in the command, but other than that, there’s nothing tricky. But we’ve only generated a SQL string. We haven’t actually done a database call. That’s what you need get_col for. To do this, we simply pass $sql_query to $wpdb->get_col and that’s all there is to it. The keys to the kingdom (of data)! So, why did we get the keys, and not the data? Well, remember we have a pattern of custom fields that all end in _description. If we add another one later, we don’t need to modify the code. We just need to stick to the same naming standard. When programming, it’s really important to avoid hard-coding values whenever possible. Your code will be more useful in the long-term and it will force you to look for time-saving patterns. In short, your code will just work. In $description_keys we have an array. Because I need the related url fields, I iterate through the array and do some string manipulation. Basic PHP. So, now that we have all the keys we want from the postmeta table, what do we do with them? 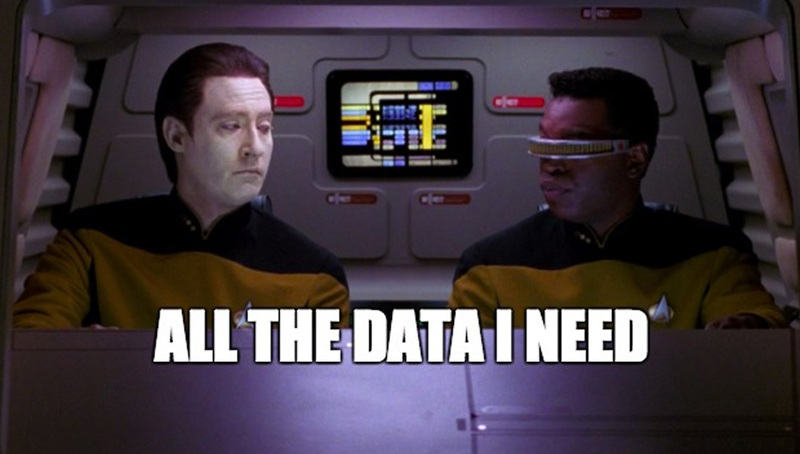 It’s great that we have all the keys, but what we REALLY want is the data. Well, first of all, we have to turn the array into a comma-separated list for the SQL call… so we use implode with some extra quotes on each side. We need those quotes. We’ve also done some sorting and get the post_id, which will be handy later when sorting the data. Finally, we’ve GOT an array of a bunch of meta fields. We did it in TWO calls to the database and if any custom fields are added later that end in _description we’ll also get those without changing the code! 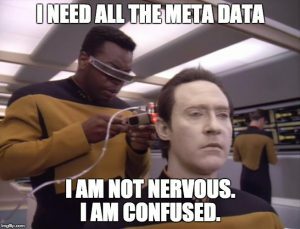 All your meta data are belong to us! We’re almost there. The goal is to display a lists of all Product Profiles and link to each document… so we are going to have to categorize the data first… phew! More work! But I’ll leave re-arranging the meta-data from the get_results call to another post.